That, without a doubt, is more like it. While I watched this, my response to every inning was pretty much, “Exactly!” And if we do that more often we’ll be in great shape. We were considerably shaken by that four-game tragedy with the Yanks but righting the ship now could solve that problem. A roster like ours gives us plenty of time to get back on track, standings-wise. But like I said yesterday, probably the best and lowest-anxiety approach at this point would be to attempt to forget about the standings and adopt a more game-by-game focus. If we win games, the standings will come. They have to. There’s no way the Yankees are good enough to sustain such a sizable lead in the AL East. Thus, onward to last night’s performance. It really was a five-star effort. Don’t look now, but Clay Buchholz’s improvements are showing. He’s not the pitcher he was last year, and that’s a good thing, in more ways than one. Not only is his control better, but much more confident and mature, and that’s key with such a young pitcher. In his last three starts, he’s faced Sabathia, Verlander, and now Halladay. He held the Yanks to two runs over six innings but lost, held the Tigers to one earned run over seven but lost, and finally held the Blue Jays to one run in six innings and won. It was the only run the Jays scored in the entire game. One walk, four K’s, nothing but ace. Of course the irony is that this matchup could’ve been reversed. 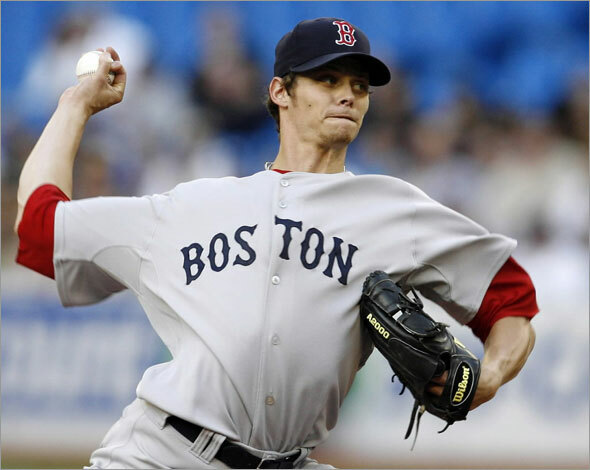 It could’ve been Buchholz pitching for the Jays and Halladay pitching for the Sox, and it would’ve been Buchholz who would’ve won it for Toronto. And that’s why Theo is a genius. The relievers delivered what can easily be considered one of the bullpen’s best outings of the season. Ramirez, Okajima, and Saito no-hit the Jays for three innings. Six strikeouts and only one walk between them, and that, my friends, is how you get it done. The final score was 6-1, so props go to the offense as well. V-Mart, Ortiz, and Gonzalez each collected two hits. Youk and Kotchman each collected steals. Ortiz, Gonzalez, Ellsbury, and V-Mart each batted in one run. Bay batted in two. Four of the six runs scored courtesy of the long ball. First, Big Papi led off the second with a homer to right, collecting the 800th RBI of his career. That’s a lot of RBIs. Bay followed with a two-run shot in the fifth to left. And finally, with two out in the ninth, V-Mart hit a homer of his own into left field, just to make sure we got the message across. Needless to say, that wasn’t Halladay’s best work. He was out after five and took the loss. Yes, sir. Congratulations to Dustin and Kelli Pedroia on the birth of their son, Dylan! Pedroia will be back in the lineup tonight with something to celebrate. And Red Sox Nation celebrates another return tomorrow: the return of its president. Welcome back, Jerry Remy! He’ll be in the booth tomorrow with Don Orsillo to start off the series with New York. And he’ll bring Wally in his Adirondack chair for good luck, as usual. He says he probably won’t be going on the road trips for a while, but I’m just glad he’s healthy and back in the swing of things. He’s been missed, and it’ll be good to have him aboard again. Everything seems to be falling into place. Buchholz’s hard work and dedication has payed off, Youk returned and made his presence felt, Pedroia is returning tonight, Remdawg is returning tomorrow, we’re meeting the Yankees for a rematch but on our turf; I’m psyched. The only negative is that Tek has missed his second straight game with neck spasms; that’s not good. We all know what happened in 2006 when Tek got injured; the team started dropping like flies to the DL and we missed the playoffs completely. Luckily, it doesn’t sound too serious, and we have the option of starting V-Mart behind the plate. Either way, this is probably the most important series of the season so far, but not just because of the standings. It’s also a chance for us to spend more time feeling them out and getting comfortable with them, just in case we have to face them in the playoffs. Plus, beating the Yankees is just fun. There’s always that.